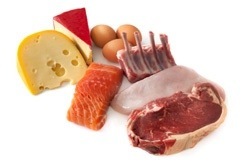 Lean proteins are low in fat, calories, cholesterol and are great diet foods that are also clean. Most often, people who eat clean food purchase naturally fed and organic animal proteins to avoid added chemicals and growth hormones. For leaner options, the National Heart Lung and Blood Institute suggests trying turkey and chicken instead of beef, egg whites instead of a whole egg, beans and fish fillets. This entry was posted in Fat Loss, Healthy Eating and tagged clean eating, eggs, fat, Fat loss, fatloss, fish, health, meat, protein. Bookmark the permalink.